1 PMS color printed on Side 1 using heavy coverage. 12pt C1S Semi-Gloss stock coated with Aqueous Gloss. 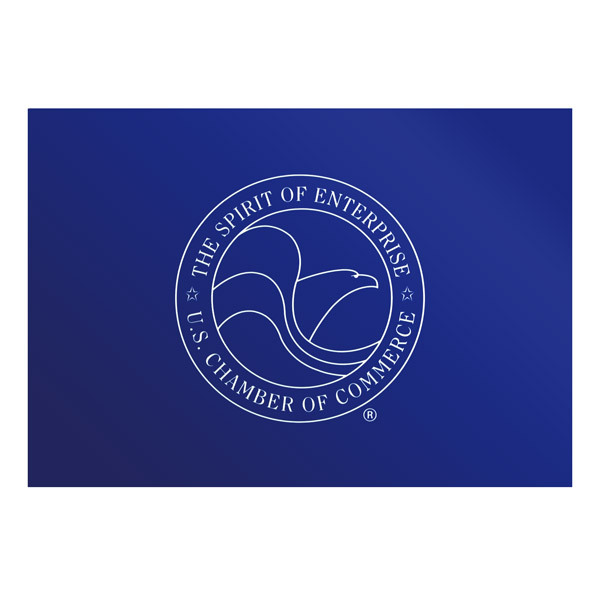 The U.S. Chamber of Commerce projects a regal yet youthful tone with this photo holder. Its blue and white color scheme points to patriotism, without being so overt as to include red. Slim lines on the official seal create a delicate, stylish cover. The Chamber's playful side shines with a white flowery border around the decorative deckle cut frame. The flowers balance out the writing at the top and bottom of the frame, which commemorates the Chamber's Regional Government Affairs Conference and helps attendees enjoy memories of the event for years to come. 2 foil stamped areas on Side 1 of uncoated 100lb Deep Black Linen stock. Prestigious Pepperdine University created this design to commemorate the Pepperdine Associates Dinner, which completed an extensive fundraising campaign. Brass foil on a black background forms a regal, high-end style. The photo's border is a thin brass-colored rim; its reflectivity draws attention straight to the image and brings a bit of sparkle to the interior. Side 1 printed with 2 PMS colors using heavy coverage. 14pt C1S White Semi-Gloss stock coated with Aqueous Satin. 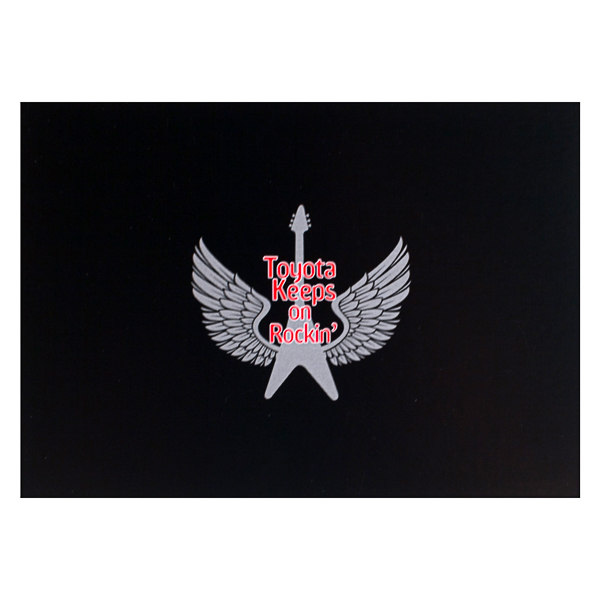 Toyota helps its employees celebrate sales with this rock 'n' roll themed photo folder. An electric guitar bears a pair of angel wings under red lettering that stands in sharp contrast to the black panel for a bold, edgy look. The black deckle cut frame brings a bit of the cover's dark style to the interior, while the white left panel offers the perfect place for Toyota employees to label when, where, and why the photo was taken. 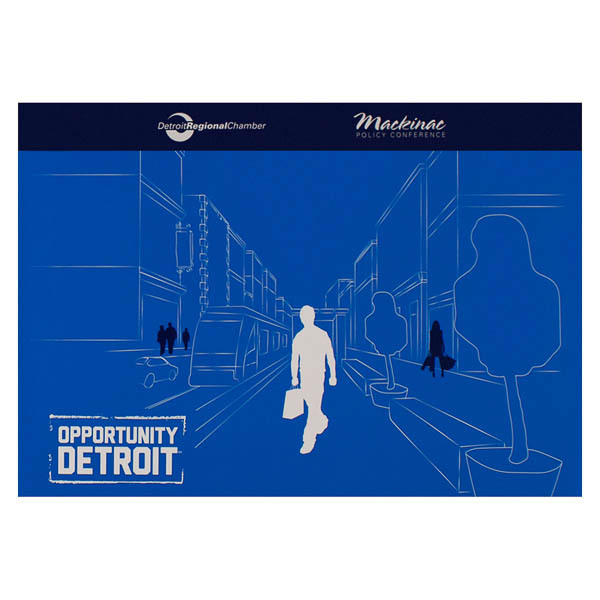 Silhouettes and outlines on a blue panel mimic the look of blueprints, a salute to the development and opportunities in Detroit and its surrounding cities. The design's blue and white colors are associated with innovation and industry. A photo in the decorative frame lets attendees memorialize their time at the Detroit Regional Chamber's Mackinac Policy Conference. Display and protect photos with this dual-purpose product. 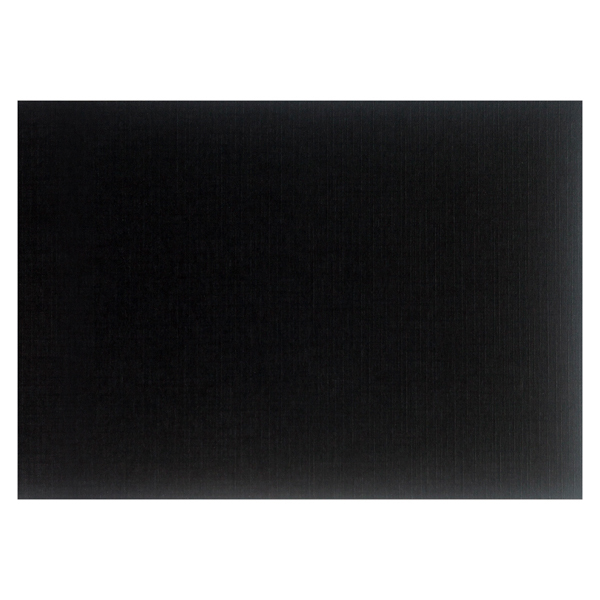 When closed, the cover safeguards any 6" x 4" landscape photo from dirt, dust, and damage. Open, the panels self-support to display the photo upright on a shelf or desk. Print custom text on the frame to commemorate the event at which the photo was taken, or use the wide canvas of the outer panels to showcase your brand's name, logo, or other relevant information. Dimension Closed: 6 1/4" x 4 3/8"
Dimension Open: 12 15/32" x 4 3/8"